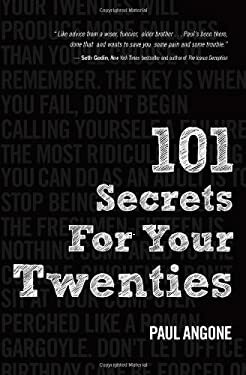 "e;Wow, may I just say how freakishly applicable these 'secrets' are to my life in my 20s? "e;@ABsport19"e;I haven't laughed all day, until I read this. Hysterical & brilliant truth... So thankful for @PaulAngone"e;@kenin312"e;Probably some of the best pieces of advice for 20-somethings ever. I especially love 5F, lol"e;@Emilyann54"e;I wish I had this list when I was in my 20s...I hope more people in their 20s, feeling all alone can read this. "e;Reader, AllGroanUp.comEvery twenty-something needs a little black book of secrets. Our twenties are filled with confusion, terrible jobs, anticipation, disappointment, cubicles, break-ups, transition, quarter-life crisis, loneliness, post-college "what the heck," moderate success sandwiched between complete failure. We need a worn andweathered guide stashed somewhere close by to help shed some light on this defining decade.That guide is this book.Expanded from the blog post "e;21 Secrets for Your 20s"e; that spread like Internet wildfire with nearly a million readers in 190 countries, "101 Secrets for Your Twenties "will encourage, inspire, prompt a plethora of LOLs, and kick-start your life forward with its witty, honest, and hilarious wisdom-stuffed pearls to help you rock life in your twenties." New (13 available) BRAND NEW. Over 1.5 million happy customers. 100% money-back guarantee. Make your purchase count: support Better World Books' worldwide literacy partners.